Multiple trials went underway for the growth of empty JT2 in knockout MetE media to definitively confirm that the predicted results occured in regards to CcaS/R JT2 and empty JT2 growth. As the goal of the experiment was to assure that there was no “leaking” of methionine from the CcaS/R JT2 cells when stimulated with methionine production, leaking that could support the growth of another population. The following test matrix was performed to assess the possibilty. In this chart, a negative control refers to an experiment where there was an expectation that there should be no bacterial growth as per our hypothesis, and a positive control denotes an experiment where there should have been growth expected. As can be seen from the chart, the experimental trial, in which the CcaS/R JT2 strain was grown and removed from the methionine knockout media, had no growth once empty JT2 was introduced into it. This was an encouraging result as it suggested that there was little or no “leaking” of methionine produced by the CcaS/R JT2 during growth into the media, and thus the empty JT2 did not have any means to grow. The minor growth of CcaS/R JT2 as a positive in control in trial 2 was expected, and was done to confirm that there would be no adverse factors from the removal of CcaS/R JT2 that were causing the introduced empty JT2 to not be able to grow, and that the composition of the media was static. 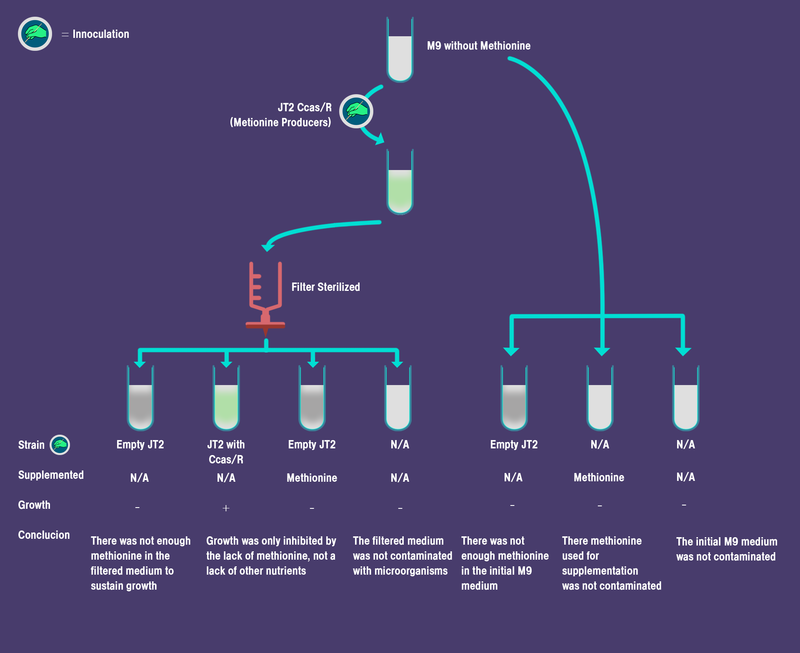 Trial 3 showed with the repliaction of experimental conditions and the addition of MetE that the reason that the growth was not happening in experimental conditions was in fact the lack of methionine in the M9 media. This showed growth as expected. Trial 4 indicated no growth as expected. This was carried out, with the removal of the CcaS/R JT2 and addition of the antibiotic, to confirm that all the bacteria was being taken out and that no other bacterial contamination was what was being seen in the positive control tests that had reported growth. Trial 5 similarly was carried out with stock M9 to assure no environmental contamination was in the media from the beginning, especially bacteria that required external methionine to grow. Trial 6 was carried out as a negative control to assure that the stock media itself was not contaminated with any nutrients that could be used by the empty JT2 to grow. This was important as it is possible that trace amounts could have been consumed in the other trials by the CcaS/R JT2 bacteria and thus were not reflected in the experimental trial. Finally, the 7th trial indicated that the empty JT2 strain that was in this bacteria was healthy and could grow in the desired conditions within the M9 media, with the methionine and the KM from stock solution. Our comparison of the flow cytometer against pour plating started with a fluorescent and a non-fluorescent culture of roughly the same OD values. Below our initial ODs and results from both the flow cytometer and pour plating. These results lead us to believe that the flow cytometer is representative of pour plating, indicating that the flow cytometer is most likely capable of giving accurate readings of a 50/50 population of fluorescent/non-fluorescent cells. Four sample tubes of JT2 CcaS/R-containing cells in M9 were made, and all were placed in the turbidostat. The samples were made by inoculating the cells off a plate into complete M9 made with casamino acids as the amino acid source. Two samples were grown under only red light, and two under only green light. The samples were optically insulated from each other. The cells were allowed to grow for 3 hours to acclimatize them to the light conditions they were being kept under. Unfortunately, though the doubling times for the two green-light samples were 53.8 and 55.8 minutes, the doubling times for the samples grown under red light were 45.3 and 61.2 minutes. The red-light sample doubling times were too far apart to be averaged reasonably, and therefore no conclusion could be drawn from the experiment. Additionally, the team realized that the metabolic load of MetE may be different in media made with casamino acids versus media made with an amino acid mixture without methionine. Therefore, the experiment was not repeated and estimates of metabolic load would henceforth only be obtained by observing growth rates under different light conditions in M9 made without methionine. See pages 77 to 79 in the online lab book for additional details. In order to automate experiments and make the designed system more useable, the team set out to create a "robot" capable of measuring cell fluorescence (and hence co-culture composition). See the "Automation" page for full details. For our proof of concept, we wanted to use two populations of E. coli: slow growing DH5alpha with a GFP marker and light controllable JT2 with CcaS/R. Before creating a co-culture with these two populations, we needed to determine how they behave on their own. Before trying to create a stable co-culture, we had to confirm that we could control the growth of a single population of E. coli. This was done by replicating the experiments from the paper. Below is a graph showing the growth rate of JT2 Ccas/R under three different intensities of green light, 24%, 48.8% and 100%. 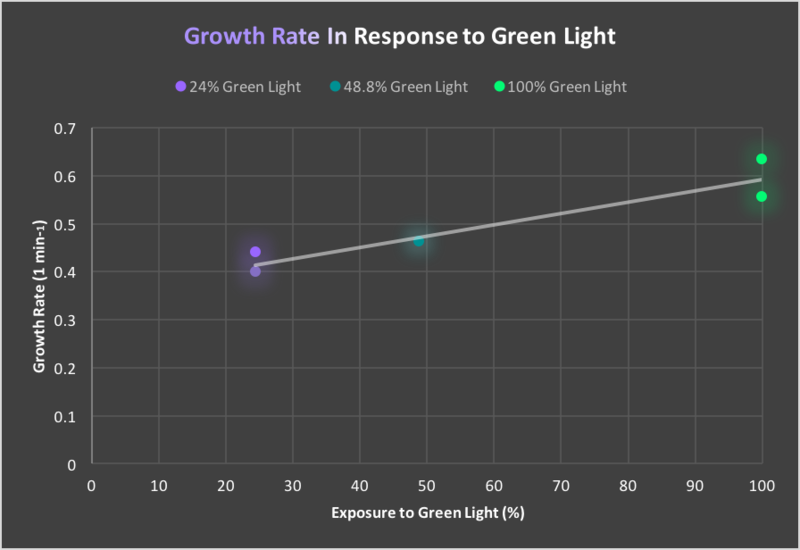 Increased green light exposure resulted in increased growth rate. This is what we expected to see based on the results from the paper. Each Point represents the growth rate of a single tube of JT2 Ccas/R under 24%, 48.8% OR 100% green light. Growth rate was measured in duplicates for each light intensity. We wanted to dig a little further into the cell’s response to changes in light intensity. To do this we measured the level of GFP expression for each population under different intensities of green light (using a flow cytometer). 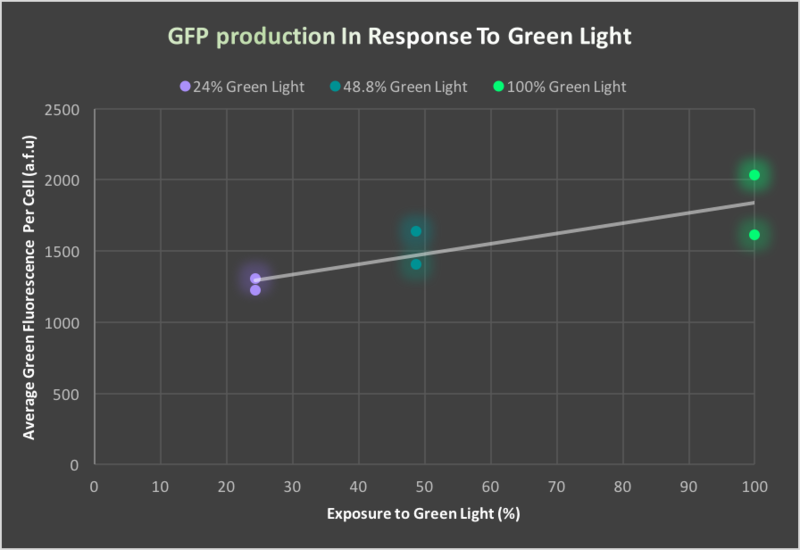 Increased exposure to green light resulted in increased GFP expression. These correlates to increased CcaS/R activity and MetE expression. Note: GFP is used as a proxy for MetE expression because they are both under a CcaR promoter in all characterization experiments. 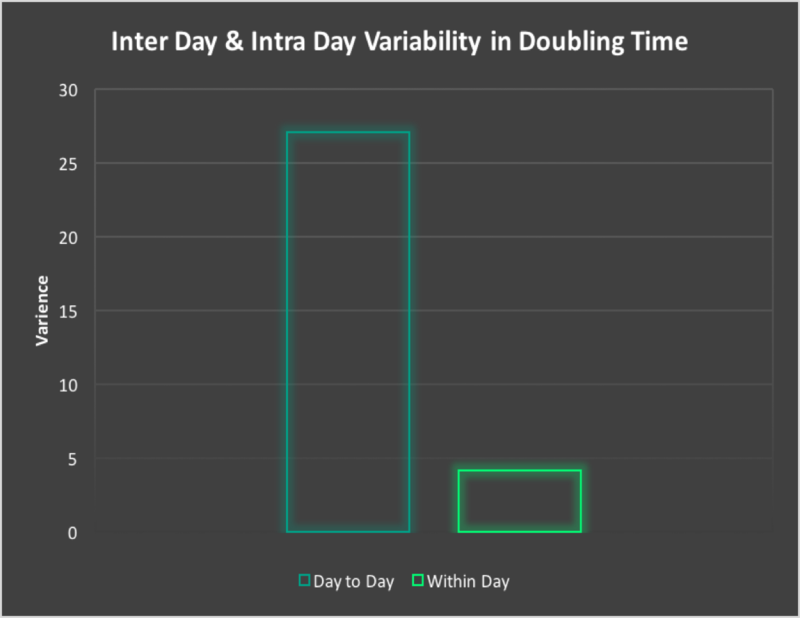 When comparing doubling times of replicates done on different days a significant amount of variation is seen between samples. However, when comparing replicates on the same day they match well. Solution In order to compensate for this day to day variation we will have to implement our Specific Model Predictive Controller. This model uses an optimization technique known as Moving Horizon Estimation (MHE). The control algorithm will take into account the day-to-day variability and adjust accordingly in order to still perform optimally.